This is virtually next door to the Roman Baths, so you can't say it's not convenient. 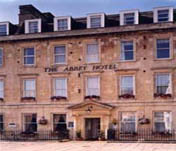 Located on North Parade and just five-minutes from Bath Spa Train Station. This privately owned boutique hotel is home to some seriously stylish yet thankfully ungarish bedrooms. Most boutique properties tend to get go overboard, so its good to see the Abbey Hotel reigning in the usual excesses and preerving the tradition of the orginal building. The result is a classic Georgian property with elegant roman columns and rooms bathed in light and packed with modern ameneties. Multi-channel TV, free internet access and 24 hour room service is provided to guests. The Roman Baths, Thermae Spa, the Abbey, Pulteney Bridge and Parade Gardens are all on the hotels's doorstep.